Yu-Gi-Oh! TCG Event Coverage » Winners of the 3 vs. 3 Team Tournament! Home > 2018/03 - Salt Lake City, UT, Yu-Gi-Oh! Championship Series	> Winners of the 3 vs. 3 Team Tournament! Take a look at the winning team from the 3 vs. 3 Team Tournament at YCS Salt Lake City! 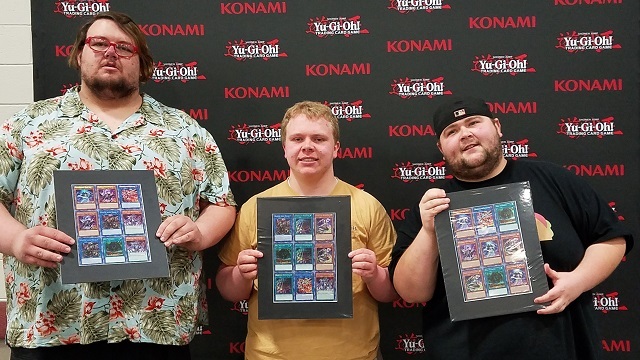 Steven Cervera, Brennan Jones, and Joseph Terhune teamed up to win the event and take home exclusive uncut sheets of Secret Rare cards. Congratulations! Top 16 Feature Match: Adrian Shakir vs. Vincent Paglia Sunday’s Dragon Duel Top 4 at YCS Salt Lake City!